Who couldn't resist going to Safari World in Bangkok? It would have to be on top of your list for a fabulous fun filled family day out. And it matters not whether you just want to take a drive through the picturesque open zoo, (reminiscent of an African wilderness) or get up close and personal with a few friendly dolphins or perhaps even take in some of the special action and stunt shows that are on offer throughout the whole day. After America, Thailand has an (if not a little over the top) reputation in claiming to host some of the greatest and most popular theme parks in the world. While this may certainly be open for some discussion, a day out at this particular safari park may well be worth your while. Because there are so many avenues to explore here, you are bound to find some, if not all the activities, a real treat. And if you are an adult, why not pretend to be a kid for the day and have some fun. Though there are so many areas to explore here, Safari World is actually split up into two distinct zones. One is the Safari Park where you'll get to see hundreds of different animals from around the world in an open zoo wilderness setting. And the other is a Marine Park where several shows are performed on a daily basis including a simulated James Bond spy action stunt show, a cowboy stunt show straight out of a Hollywood movie set and a dolphin show, to name but a few. Would you like to go on Safari World Tour? Yes! Even in Thailand, you can go on a safari world tour. This Open Zoo and Marine World in Bangkok covers an area of some 170 acres and is divided into 2 sections. The first one is the safari park that houses a large variety of animals in their natural habitat and the second one is the marine park where you'll get to see exhibits of marine as well as some rare animals. Here you'll also get to enjoy performances by trained animals such as dolphins, birds, seals and monkeys. The duration of this tour as seen above is from 7:00 am. to 5:00 pm. This Bangkok safari tour also includes a hotel pickup and drop-off. Recommended. Booking your tour from this page (at no extra cost to you) would not only put a little extra cash in my pocket but you'd also be helping me maintain this website so that I can continue giving you more Thailand travel information. The entrance fee to Safari World is, in my opinion, a little expensive, especially if you are visiting with a large family. However, if you are limited to a specific time frame and only want to visit one of the two parks, you need only buy a ticket for that designated park, or you could purchase a combined ticket at a slightly better price. When I was last here, the cost of the combined tickets was 700 Baht for adult foreigners and 450 Baht for children. There is, of course, an extra charge if you wish to go on one of the boat rides. Nothing is ever cheap these days. The locals pay considerably less when entering many of these theme parks and or national parks including many other places of interest throughout the country. As a tip, should you be a foreigner on a tight budget with a Thai partner, it's possible to save money if the two of you enter the park at separate intervals. But whatever your motive may be, it would be appreciated if you keep this best-kept secret to yourselves. We don't want everyone to know about this, now do we? 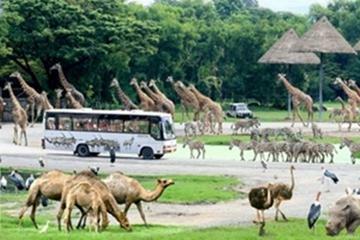 To get back to the real reason you're possibly here in the first place is that you could visit the safari park with either your own transport or you could join one of the special coach tours. However, the real benefit of using your own transport is that you can linger longer wherever that might be. This is especially true if you fancy capturing a rare photo opportunity of a tiger or giraffe when time is not a priority. Though I wouldn't recommend you wander too far off from your vehicle. The Safari Park is a wonderful opportunity for you to see a wide variety of animals. But in order to keep predators at bay from prey at this park, carnivores and herbivores are kept separately to ensure their safety. And yours too. Zebra, giraffe, deer, rhino, camel, ostrich, as well as the usual assorted herbivores, are kept in one enclosure and carnivores such as lions and tigers are kept in another. Because of the extremely hot weather lions and their counterparts usually, spend most of their time lazing around in shaded areas. Please don't expect to see much action here. For that, you'll have to visit Africa. It's probably best to go to the Marine Park before you go to the Safari Park as some of the shows you may not want to miss, start in the mornings only. There is an Orangutan Show that starts at 10:20 am and a Sea Lion Show that starts at 11:00 am. Unfortunately, these particular shows are not repeated again during other times of the day, unlike some of the other theme parks in Thailand. Once you've seen these two shows your next option would be to go to either the Bird Show or the Cowboy and Indian Stunt Show both of which start at 11:40 am. I chose to see the latter. Bird shows are two a penny in Thailand, but cowboy shows are not nearly as common. It's a matter of what floats your boat. I am sure the kids will be pretty impressed with all the action here. It gives you the feeling of being on a real movie set. Lots of gun powder and gun tottering guys and dolls going through the motions. The commentary alternates between Thai and English and though not great, it's a lot of fun and good for a laugh. The next attraction your kids will really enjoy is the Dolphin Show which starts just after lunch at 1:30 pm. But before that, you might want to visit one of the new places of interest in Safari World called Mini World. Here you'll find not only a budgerigar with different species of small multi-coloured birds from around the world but also a larger aviary where you'll find much bigger birds. For a few Baht, you can participate in the feeding process. For the smaller birds, this might not be a problem, but you'll have to be a lot more careful with the larger ones. The latter may want to take more than the food on offer. Ouch! Apart from the usual common garden variety of animals such as crocodiles and monkeys that are so plentiful in Thailand, there is also a large pond at Mini World which is home to a huge number of Koi Fish who seem eager to be fed. It comes as no surprise that no matter where you go in the park, there are not only places for humans to be fed but there is always food available for other creatures of the world too, including fish. I once fed the fish a whole loaf of bread which I have to say was gone in seconds. Somehow I avoid feeding crocodiles. If you are seriously into the whole feeding thing, then why not pop upstairs to the Safari Terrace and feed a couple of giraffes there. No, I'm not kidding you. The height of the terrace permits you to come face to face or if you like, head to head with these extraordinary tall creatures. You certainly wouldn't be able to do this in the African wilderness. So dig into your purse or wallet for the 40 Baht you need to buy a bucket of leaves which is some of the favourite food giraffes love to eat. You'll be amazed as they stick their long tongues out too. Okay, so now that you're skilled at feeding a few animals and hopefully have your hand intact, you can head down to the Action Spy Show which starts 2:30 pm. It's thinly based around a James Bond theme. I wonder what Ian Fleming would have made of it as the plot is a little week and all the commentary is in Thai. Though mostly for kids this action show is nevertheless fairly entertaining. If lots of fire and loud bangs is your thing, then you may just enjoy the performance. If exhaustion hasn't all but consumed your energy, your legs haven't caved in and your hands haven't been bitten to threads, you've still got one last show to see before heading home. It's possible you've seen this type of performance elsewhere, but since you are here, take the kids to see the Elephant Show which starts at 3:00 pm. Though the elephants perform all the usual stunts such as football playing, tightrope walking and the rest of it, kids will love the shows. Before signing off I have to say that although Safari World is great for a family type day out, it is not something you are going to rave about for years to come. Apart from the hefty entrance fee, if you start adding up all the extra costs for boat rides, photos with animals, food for animals and souvenirs etc, it can be a pretty expensive day out for the average family. Also, some of you may feel that Safari World doesn't quite add up to world-class standards, but if you want kids entertained, then it's surely one of the best places of amusement in Bangkok. What I don't agree with is the double price system for foreigners. There is no need to go hungry at Safari World as there are two restaurants that offer buffet type menus. The Jungle Cruise restaurant can seat up to 1,700 guests and the other simply called Safari can seat 800 guests. There are two fast food outlets offering a wide selection of Thai and international cuisine and throughout the grounds, there are stalls selling cold drinks, ice cream and assorted snacks. If you are at all interested in buying Thai handicrafts and other assorted trinkets, there is a souvenir shop on the premises offering a wide variety of gifts. However, I have to warn you that prices for any of the items here are three to four times more expensive than similar merchandise found elsewhere in Bangkok. Getting in and out of Bangkok is a real nightmare so for the quickest, easiest and safest way to get to Safari World, take one of the tours. Public transport cannot be trusted unless you have your own personal Thai taxi driver friend as I have. You can make your way there if you have your own transport, but for a trouble-free outing, I suggest you take a tour. The tour company will pick you up from your hotel. You'll find booking details near the top of this page. And it's less than an hour by road depending on traffic conditions. Safari World is open 365 days a year from 9:00 am until 5:00 pm.